Intuitively being demand driven indicates having a pull-based manufacturing system customer orders trigger sourcing and production activities. However – it is rarely the case, that this is possible – due to the long lead time this would cause. This article will point out the requirements to a market driven supply chain. The supply chain should be responsive to true demand keeping a high customer service level. Possible demand scenarios must be evaluated and consequences to the supply chain identified – and the time to do so is very short. I define customer service level as a combination of lead-time and delivery precision. For manufacturing companies this a critical factor to the continued success of the company – and they set targets for both. Meeting these are typically the number one priority for the manufacturing system. In a manufacturing company, the operational response to the uncertainty of not knowing future demand is to add cost in terms of time (slack) and material into the manufacturing system. It is done by adding inventory, increasing no of shipments or speed of transportation or increasing supply chain cost (capacity/cost of materials). The company will try to create a supply chain balance where inventory, transportation and supply chain/capacity costs are minimised still meeting the requested customer service level. The four corners of the model are interdependent – which means that optimising cost in one area generates extra costs in other areas – and vice versa. Being responsive is not about cutting cost – but to ensure sufficient flexibility to follow changing demand. The combination of volatile demand and a continuous globalisation of the sourcing base does not make it easier to ensure responsiveness. It thus takes time and thorough analysis of set up and opportunities to determine the needed flexibility and trade-offs between the corners of the supply chain balance model. During this analysis – the deltas for creating additional responsiveness should be known, i.e. what is the preferred strategy when volatility increases. The total level of cost assigned to creating responsiveness depends on the volatility of the market demand. The cost-mix is based on opportunities and strategic decisions. In companies selling into very volatile markets, this advocates for being more agile than lean. Agile manufacturing systems are often not as cost-effective as lean ones – but you can keep the customer service level higher in volatile markets. Being responsive is also about supply chain transparency. To ensure that the company has the right level of responsiveness, the company needs to measure and analyse the four corners in the supply chain balance model and have tools in place to adjust the balance if needed. 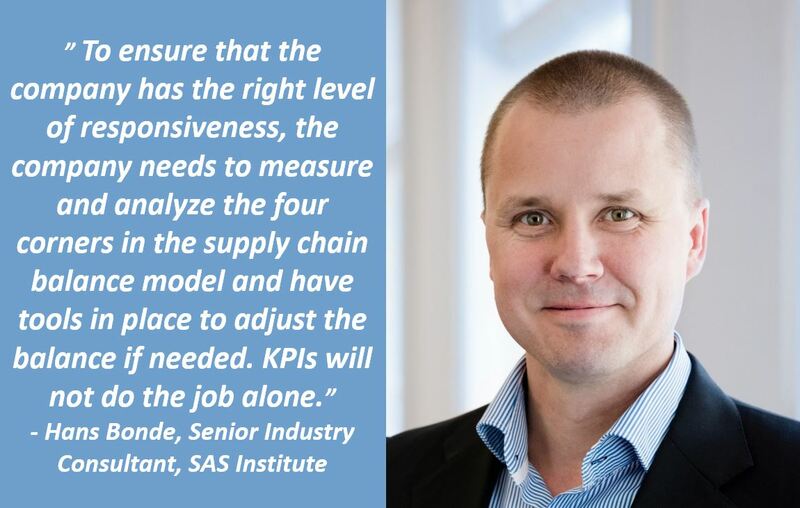 KPIs will not do the job alone. 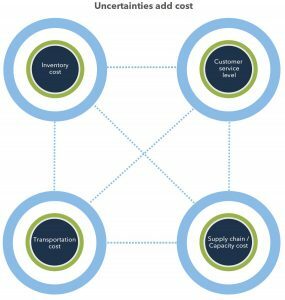 How is the flexibility to add/remove/rush/postpone purchase orders on critical raw-materials, and what are the cost associated with doing so. How big is the safety stock on a given SKU – and how often is it used. Where are the risks in my inventory in terms of e.g. obsolescence or zero stocks. Traditional BI is not sufficient to answer such questions. It calls for much deeper analysis of inventory data – in combination with forecast, plans and uncertainties. You can set up similar monitoring requirements for the other corners in the supply chain balance model. In a previous article, I wrote about demand driven forecasting. 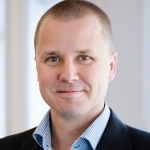 In this article, I explained that a central element in demand driven forecasting is to create multiple forecast scenarios by changing the values of the demand drivers – i.e. change the circumstances and conditions for the demand. 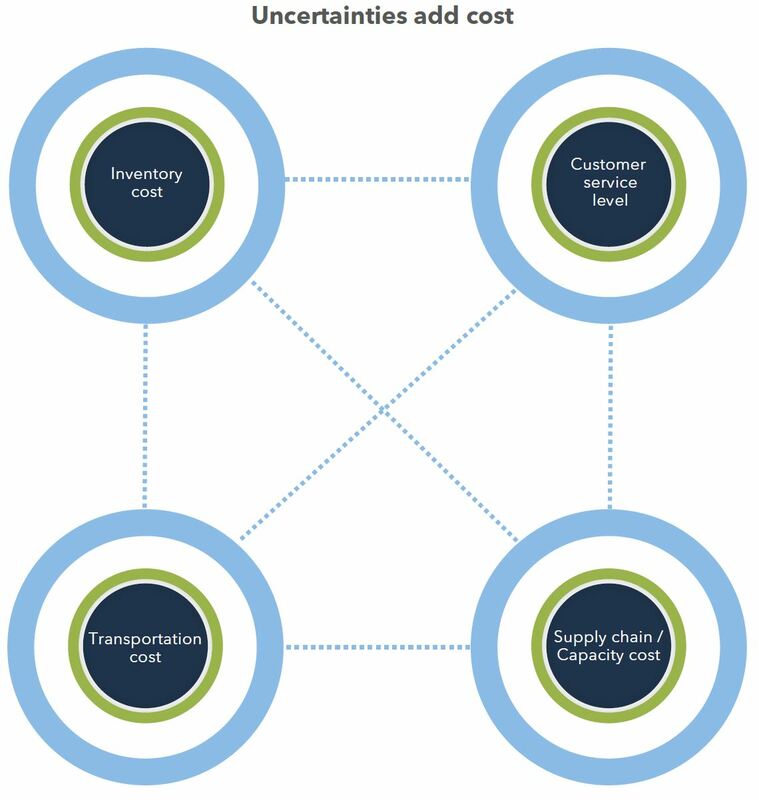 Step one of the planning process in a market driven supply chain is to test demand scenarios against the capability of the supply chain to determine if they are feasible. Changes to the production and inventory plan in order to match the forecast. What is the flexibility to meet unforeseen demand compared to the forecasted. This will help to determine if the forecast scenario is attractive to all forecast stakeholders and outline the risk. To test multiple scenarios requires that the planning software can create a supply plan matching the demand plan very fast – preferably in a matter of minutes. The plan can be at a rough level, but should be detailed enough to establish if the forecasted demand can be met – or if plan changes drives significant cost. Step two of the planning process in a demand driven supply chain is to optimise inventory and production plans to meet selected demand profile. True inventory optimisation takes its starting point in the forecast and the forecast error. The optimisation of the finished goods inventory is what drives the ordering in the supply chain – i.e. production and purchase orders. It can be argued that most manufacturing companies are operating market driven supply chains – as they are able to deliver 90+ percent of the order lines in time. However, this is often reached through daily fire-fighting and constant frustration. Continuous alignment of supply and demand and contingency plans for restoring the supply chain balance.